NYC roach extermination requires a comprehensive approach tailored to unique situations. Our products & methods are tried and proven! When you find a cockroach in your home, your first instinct is probably to kill it. However, if it is a full blown roach infestation you are up against, it may seem like there is nothing you can do! No matter where you live in NYC, you have likely run across cockroaches. They are among the most common pests around the world. There are around 4,600 known species of roaches, and 25-30 of these are associated with human habitations. Roaches multiply rapidly, spread disease, and are a cause of distress and annoyance for people around the world. Here in NYC, roaches are a persistent problem, and most home and business owners have to schedule regular visits from a cockroach exterminator. If they fail to do this, it is only a matter of time before they have a large infestation, because the roaches tend to flee from a treated home and take up residence in an untreated one. It is therefore important to proactively protect your home from roaches by consulting with an experienced pest control expert. Roaches pose considerable health risks. They can contaminate food, trigger allergic reactions, and asthma attacks. Cockroaches are repulsive to people merely by their presence. Besides, they have been found to be an important source of allergy in people, trailing only after house dust. And, they transmit disease. They usually get into houses in grocery bags, or wandering in from outdoors. Once in, they breed by the thousands. Unlike other pests, roach control is done year long—because roaches infest homes all year long! B & D Pest Solutions exterminators will target key areas for treatment—behind the refrigerator, stove and dishwasher, under the sink, and behind the shower and washing machine. Yes. B & D Pest Solutions offers you professional expertise and personalized service to treat termites, fleas, spiders and any other pests that infest your home or place of work. Contact B & D Pest Solutions today — we are your roach control specialists! Bait Trays – We place them in kitchens and bathrooms. Roaches like to live where there is food, warmth and moisture. Boric Acid – Deadly to roaches but low in toxicity to humans and pets. It is effective in small amounts and retains its potency for a long time. Small amounts should be applied or else the roaches will avoid the treated areas altogether. Since roaches live where there is food, warmth and moisture, sanitation is very important in prevention and control of a roach infestation. Seal food containers, clean up spillages and empty soft drink bottles. These measures will help keep roaches away. American cockroaches are usually 1.5 inches long and have wings just as long as their body. Their color is normally a reddish brown. They also have the ability to fly. German cockroaches are the most commonly found roach in the United States. They are only about half an inch long with wings. However, they cannot fly. They are brown or tan and always have 2 stripes on its back. American Cockroach: These are often found in kitchens and basements, but they prefer to breed outdoors and live on trees. 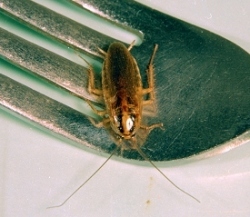 German cockroach: These cockroaches prefer to breed and live indoors, and are often found around the kitchen and bathroom. Oriental cockroach: Brown or dark black in color, these roaches love damp and cool areas. These roaches feed in decaying things and garbage, and are a health concern. If you have seen a roach lurking in your kitchen or bathroom, you should speak with our cockroach exterminators right away. Each species requires a different approach for extermination and control. Roaches quickly develop resistance to most pesticides available over the counter. Due to this, most home and business owners rely on a professional exterminator to help rid them of these pests. Bait trays: Because we know that roaches like to live where there is warmth, moisture, and food, we often place these bait trays in kitchens and bathrooms. Boric acid: This is low in toxicity to pets and humans, but deadly to roaches. It is required only in small amounts, and retains its effectiveness for a long time. Having trouble with roaches in your NYC home or business? If you have a cockroach problem in your home or commercial building, or you want to prevent one, you should take action now. Rather than wasting time and effort on DIY extermination methods, you should trust the experienced NYC roach exterminators at B & D Pest Solutions. We can identify the species correctly and, using the latest products and techniques, work hard to rid your home of these unwanted pests.